So, the United Methodist Church’s highest court in the United States has ruled that the consecration of the church’s first openly gay bishop — a married lesbian — has violated church law, the New York Times is reporting. I’m stifling a yawn now, because the ruling does matter to some people in the United Methodists Church — though, I am wondering why anyone who supports LGBT rights would want to stay in that church when there are other religious organizations that are not so narrow-minded and exclusionary. While the bishop in question, Karen P. Oliveto of Denver, remains a member in good standing pending appeals and such, she chose not to make a statement to the N.Y. Times. And so a so-called “schism” is developing in the church . . .
I’m still stifling a yawn . . .
I’m guessing the gay clergy members of the church stay because they are trying to reform the organization — which, incidentally, has 13 million members, according to the report. It’s the third-largest religious organization, after the Catholic Church and the Southern Baptist Convention. Meanwhile, Methodist leaders are not doubt worried that many of its more conservative, anti-LGBT followers may leave the church, taking their collection plate offerings with them. And just how many LGBT people would replace them by joining the church if it were to reverse its policy and allow the consecration of LGBT bishops? Probably not a lot, eh? OK, I’m yawning now, because it is much ado about nothing among a group of superstitious people who worship an invisible, mythological figment of some ancient writer’s imagination. Yes, indeed, the supernatural entity called God and all its attributes is a manmade fairy tale. 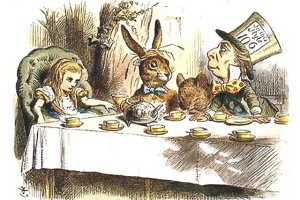 So, really, all this schism stuff in the United Methodists Church is little more than the mad tea party in another fairy tale, Alice’s Adventures in Wonderland. But all good fairy tales need an antagonist, though it is unclear who is playing that role in the Methodists’ version of Wonderland. Is it the leader of the anti-LGBT forces, or the leader of the pro-LGBT forces? It’s not so clear-cut, but one thing is perfectly clear: The Methodists are behaving like characters in a fairy tale, and a particularly boring one at that. Oh, look . . . there goes the white rabbit. I must follow him . . .
I’m always somewhat puzzled why anyone wants to belong to a club that basically not only doesn’t want them but pro-actively seeks to persecute them. What is it all about? Is it subversion? It seems unlikely because there is frankly little point in doing so. I mean what on earth is the phenomenon of LGBTQ people supporting Trump all about, or for that matter Hispanics who support Trump? I don’t care for the entirely valid point that such people can be conservative or right-wing about almost everything except either their sexual orientation or race, but to my mind it is still tantamount to turkeys voting for Christmas. If that is how you feel set up your own political or religious movement instead of misfitting into an existing one that doesn’t want you anyway.